Summer is in full swing and I don’t know about you, but I have been living in my swimsuits lately! There is nothing I love more than a cute suit and I love trying all of the hot swim trends! Today I am rounding up my favorite 10 swimsuit trends of the summer! 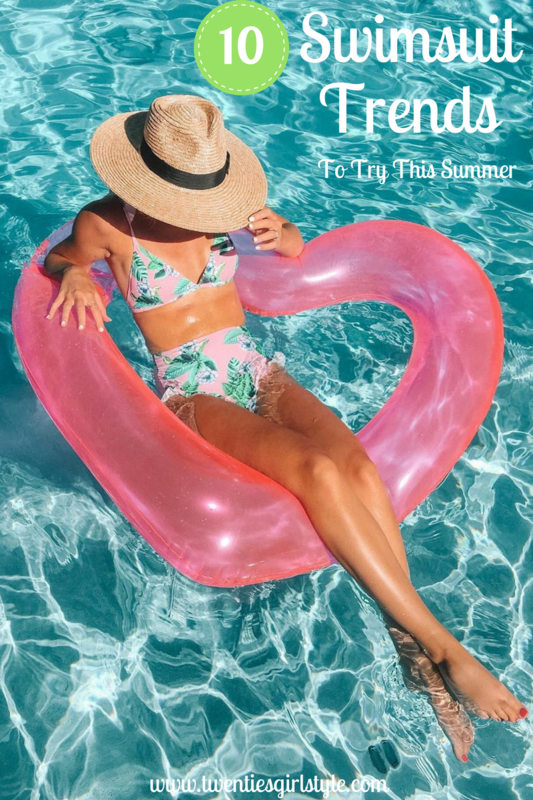 You may notice that many of these trends overlap, and I know it may be a little late in the summer to share, but this is the best time to snag new suits because many are on sale! To shop any piece, click the product images below each photo! Polka dots are such a fun and whimsy print! I am still looking for my “itsy bitsy teensy weensy yellow polka dot bikini” (or maybe just a cute yellow suit would do! ), but for now, this fun red and pink option will do! It also comes in a one piece! Shop it below! A cute suit is always better with a touch of ruffles! I picked this one up for my trip to Mexico this spring and it continues to be one of my favorites because of those fun ruffles! This suit comes from one of my favorite swimmie brands, Solid & Striped! Plunging scoopback one pieces are everywhere lately! It’s a great way to show off a little skin without showing off too much! I also love that I can pair it with shorts and it looks like a fab bodysuit! A cute palm print suit will always be my fave! This one is AMAZING! Only $14, but amazing quality, with adjustable straps and padding! This is such a cute trend! I’ve been knotting all the hems of my tops, so why shouldn’t my kini tops be knotted too! From one pieces to two piece swimmies, this is one of my favorite newest trends! PS a cute kimono is the PERFECT cover up! Check out some gorgeous options here. A one shoulder suit is so flattering! I especially love the one shoulder one pieces with the cutout middle (like pictured above). It’s a great way to try out a one piece as it gives the illusion of a two piece! I purchased a few smocked tops this year! I love that a smocked top doesn’t need padding because the smocking hides everything! This suit is by L*Space, but check out some other smocked cuties I am loving! My favorite trend of the year, you might have noticed that many of these suits shared are off the shoulder! This trend has been around for a few years, but has seemed more popular than ever! I’ve gotten questions on alot of my off the shoulder tops on how to avoid weird tan lines. I always take the shoulder straps off and tuck them into the top and voile! A strapless suit to avoid weird tan lines! This “trend” has been around for a few years now and I would say it’s here to stay! One of the most flattering fits, this is a great option if you feel uncomfortable in a two piece suit! Most of the suits I take on vacation with me are high waisted. This way I can eat allll the tacos on the beach I want, without feeling like I’m walking around showing off my taco baby afterwards! Stripes, stripes and more stripes…give me all the striped swimmies! I feel like the options of striped swimmies are endless this year! So many cute stripes! The ones I am loving the most? Bright rainbow stripes! 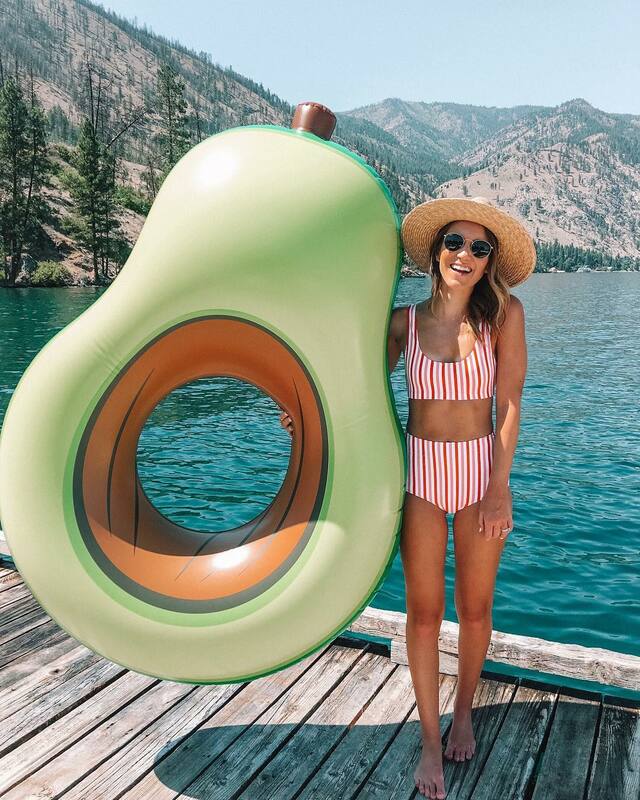 Last but not least, you can’t forget a cute pool float! Next Post NORDSTROM ANNIVERSARY SALE 2018: Review of What I Bought! I love every single one of these suits! Gorgeous photos too!